Twenty-eight years after it launched, the annual MerleFest, in Wilkesboro, North Carolina, is now halfway into another year. I arrived midday on Friday — day two of the event — just in time to catch Portland, Oregon-based old-time group Foghorn Stringband. The quartet was in excellent form, delivering a traditional set that was heavy on harmonies, with Caleb Klauder’s astute mandolin picking taking a lot of the leads. It was only a shame to see them ant-like on the giant mainstage, performing to a relatively sparse crowd. Foghorn is easily one of the Pacific Northwest’s finest folk outfits, with years of performance under their belt. Their music is best taken in an intimate setting, or at least with a steady crowd of appreciative listeners. Though their set this day was exacting and inspired, it felt a like a special secret to which only a few of us lucky folks were privy. Next, Washington, DC-based Celtic rock band Scythian unleashed a rousing set back at the Watson Stage, to an appreciative audience. During a press conference earlier in the day, brothers Alexander and Danylo Fedoryka shared the story about their first time at Merlefest, 10 years ago, when they set up outside the gate to play for everyone arriving at the festival. By the end of the day, they noticed people were coming back on purpose to bring their friends, and the group has performed at the festival ever since. 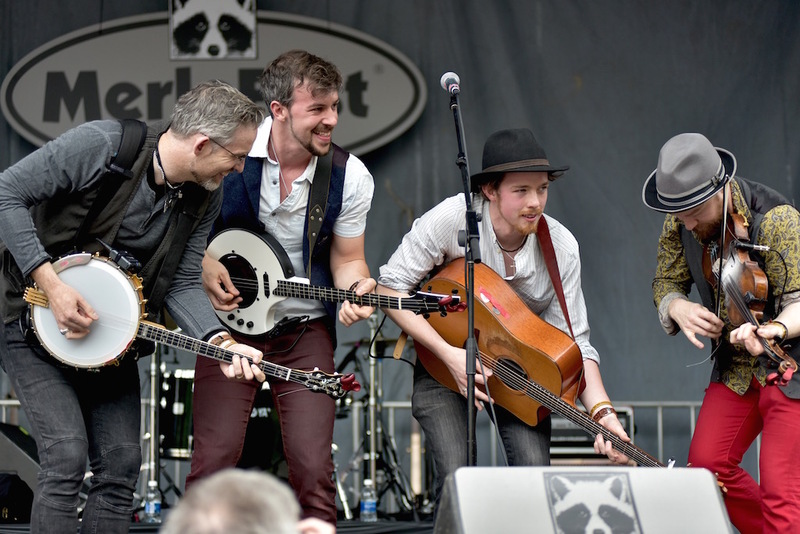 This time, they brought with them some friends from Ireland called We Banjo 3 — a tightknit quartet made up of two sets of brothers — who delivered a raucous set from the Americana stage themselves. Following Farris, Jerry Douglas’s all-instrumental set was a bit of an energetic stop sign, despite the exceptional musicianship Douglas’s band unleashed. (Now with the incredibly talented Christian Sedelmyer on fiddle.) Try to match the dexterity and artistry on that stage, and you’d come up short in any crowd. Though the set felt like yin to Farris’s yang, it’s impossible to complain about the juxtaposition of so much trailblazing musical mastery. Then finally, Old Crow Medicine Show wrapped up the night with a rock and roll-like set, sharing the story of how they met Doc Watson way back when, thanks to his daughter Nancy. No doubt everyone in the crowd was feeling thankful for Nancy’s discovery this night. They were followed by Donna the Buffalo at the Midnight Jam. Not a bad night cap for one of the nation’s most well-attended roots music festivals. But even better: there are still two more days. Let’s hope the rain holds out.